A leading Latin American centre of radical propaganda painting since 1940 - reflected chiefly through public murals - Chile is now home to a unique and extraordinarily vibrant street art scene. Since the end of the Pinochet dictatorship in 1990, Chile has embraced an era of new freedoms, clearly reflected through the prism of publicly accessible art forms. Today, old school muralists can be seen next to contemporary graffiti writers; each exhibiting a unique style yet sharing a rebellious spirit. Since 2000, politically engaged street art has cross-fertilized with graffiti to create a multi-faceted and rapidly developing panorama of politically didactic and ironically post political street art. 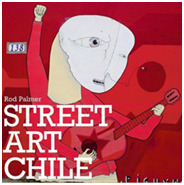 In the Chile of today, Latin American propagandistic traditions encounter the rebelliousness of worldwide graffiti; the outcome is an approachable yet defiantly anarchic street art that plays a central role in the fabric of Chilean society and culture as reflected by the artful urban colorful expressions of adorned cityscapes. Rodney Palmer is an art historian, writer and critic. He has worked on Latin American art since the 1980s when he wrote his Courtauld Institute MA report on ‘René Portocarrero and Cuban Painting 1937 67’. In 2000–01 he was Getty World Art Research Fellow at the University of East Anglia and he has taught at the University of Leicester and the University of Sussex. He was the co-editor of The Rise of the Image: Essays on the History of the Illustrated Art Book (2003) and contributor to the Atlas of World Art (2004).